Mount Elgon is an extinct volcano with the largest surface area in the world (50 km by 80km) and a caldera which covers over 40km at the top of the mountain. The highest peak is Wagagai, 4.321 m. It lies at the border with Kenya in Eastern Uganda and is protected within the Mount Elgon National Park boundaries shared with Kenya. It is home to the Bagisu and the Sabiny people and the area is well known for the high cultivation of good Arabic coffee. While ascending the peaks, you meet four different vegetation zones: the montane forest, the bamboo forest, the heath zone and moorland zone, where you can find some endemic species of plants like giant Lobelia Elgonensis, particular groundsels and everlasting flowers. At the moment there are not huts available in the mountains, but nice designated camping sites. The trekking: There are several trekking trails around Mount Elgon. The full trekking circuit to the peaks takes 4 to 5 days to complete, following Sipi or Sasa Trails. From Kapkway Exploration Centre (UWA quarter) you can take at least three different one - day hikes, the Chebanet Falls, Mountain Bamboo trail and Ridge view trail. The one day trail to see the four Sipi Falls is a popular activity and it starts from the village of Sipi. Period for the trekking: The best time to visit Mount Elgon is May and September, November and December. Are you ready for the trekking? This trekking does not require any technical equipment and it is considered an easy activity. Physical fitness and training however is recommended before undertaking the adventure. It is unlikely to experience altitude sickness in Mount Elgon. You will enjoy the peace and the stunning panoramic views from the summit and the caldera. Itinerary: Sipi Trail down Sasa Trail 7 days 6 nights This is the most recommended trail. It is gradual in terms of difficulty and it reaches the best places and view point from the mountain. Late morning you leave Kampala in the direction of Jinja and Mbale. You arrive by evening at Sipi Falls, where you will have dinner and overnight at Sipi River Lodge or similar, while enjoying the beautiful scenery. In the morning after breakfast you drive the short distance to Kapkway Exploration Center, UWA headquarter. You meet the appointed guide and arrange the luggage, porters and camping gear, ready for departure. The trail passes through montane and bamboo forest up to Tutum Cave Camp (2.667 m), named after the spectacular cave which you can see in the forest. Prepare for dinner and overnight in pitched tent.Distance of the day: 11 km. Time: 4 hours. Altitude of the day: 1000m. After breakfast you proceed the trekking through the groundsel vegetation zone. 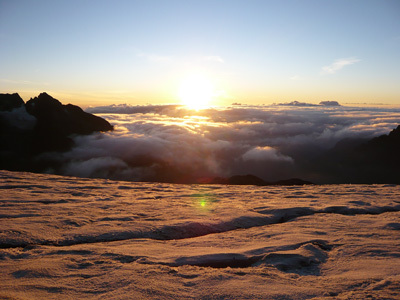 The arrival point is Kajeri Camp (3.383m) where you will have dinner overnight in tent. Distance of the day: 17 km. Time: 5 hours. Altitude of the day: 800m. After breakfast you walk sloping down after Muyembe camp to Mude cave Camp (3.500m), where you join the Sasa Trial. Dinner and overnight in tent. Distance of the day: 25 km. Time: 9 hours. Altitude of the day: 120 m.
After breakfast at 7am you walk through the moorland zone, you will pass via Jackson Pick and see Jackson pool. As you reach on top of the ridge you will see down the caldera and walk up to the main peak, Wagagai by 11 am for best visibility. After break for lunch, return to the Mude campsite for dinner and overnight. Distance of the day: 18 km. Time: 7/8 hours. Altitude of the day: - 820m. After breakfast at 7am you walk through the moorland zone, you will pass via Jackson Pick and see Jackson pool. As you reach on top of the ridge you will see down the caldera and walk up to the main peak, Wagagai by 11 am for best visibility. After break for lunch, return to the Mude campsite for dinner and overnight. The trekking ends descending to Bumasola through Budadiri Gate of the park, stop over at Sasa River Camp. In Bumasola you get the vehicle to Budadiri. Rest and overnight at Rose’s place The Last Chance (E) or proceed to hotel in Mbale. FB Time: 4 hours. 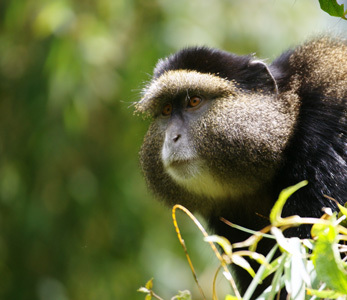 You will start your day with breakfast and later embark on transfer to Kampala/ Entebbe via the adventure capital, Jinja and Mabira forest arriving in the evening for your outbound flight.